Products IKEA not only popular everywhere, easy to use and always in trend, but also multifunctional. Caring for the comfort, economy of time, order, rationality, and at the same time and assistance to parents in the upbringing of children - one of the important functions of the manufacturer. These are the key moments "in the life of the goods" IKEA together with you we look at the cognitive survey "Children IKEA carpets for boys and girls." 1. Children's rugs, developing motor skills and communication skills. "Mathematics plus exercises at home." This group may include children's rugs HOPPLEK (From 3 to 7 years) VANDRING (For kids). Firstly, joint pastime child and parents. Second, learn to count to nine together, add the numbers, as well jump on the bright circles, learn colors and counting. Third, develop motor skills: long jump during the game. A children's mat can be used as a fun stadiometer. So, the first group of rugs we have listed functions are performed. 2. Kids rugs for girls. "Flights of fancy. Soviet dream girls. " The next group includes children's game pad RUMMET and mat in the form of heart in pink "Barbie" ERTLIG. Variegated mat for girls RUMMET by an interior room - the dream of Soviet girls! And for parents - space saving and less hassle with toys for dolls. Your daughter can play on this rug doll set posudku, toy furniture (can do without it!). 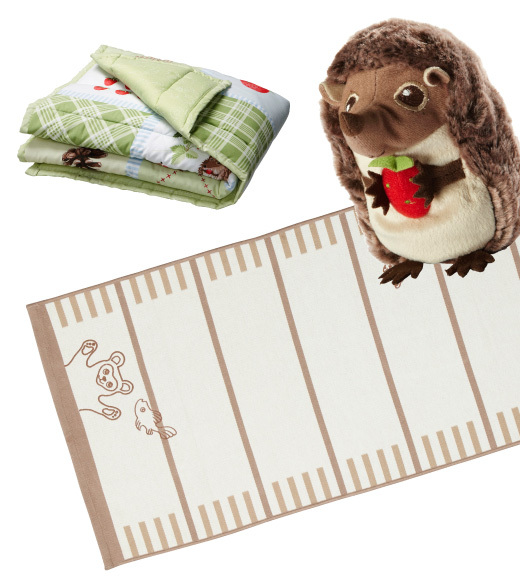 For your child these fun children's rugs will be a great play area and an assistant. 3. Children mats for boys. "Where are you holding, kid?". So to speak: mat BULLRIG interior, funny and bright. LURIG can be used as an arena for toys, animals and play "into a circus." But children's rugs from IKEA series LEKPLATS и LILLABU with a picture of the railway, signs and houses will find for dads and moms. Excellent play area, the cohesion of the parents and child development thinking, saving space in the room for other toys - these are the main reasons for the acquisition of these rugs for boys. 4. Decorative Children's mat with the image of the forest motifs VANDRING dispute. The child is easy to learn animals, learn to distinguish their tracks. You can do this with a series of soft-toy animals of the forest VANDRING DISPUTE. It is safe to say that all children's rugs IKEA one hundred percent cognitive, educational, safe thanks to the latex backing and is the assistant to the parents in the education of their children. And finally, a few words about the review of operation: all the carpets can be washed in a washing machine at 40 degrees, in the delicate washing, do not bleach, and, of course, for the rugs should be carried out regular maintenance. Construction of children's interior always associated with the choice of covers and mats on the floor. And there is such a variety of colors and also that much important mats are practical and easy to clean and clean, because they can be washed in a washing machine. Such a beautiful mat will appeal to even the most fastidious child and decorate it komnatu.Mozhno pick up pattern for every taste and interior. Very good that it can be easy to wash.